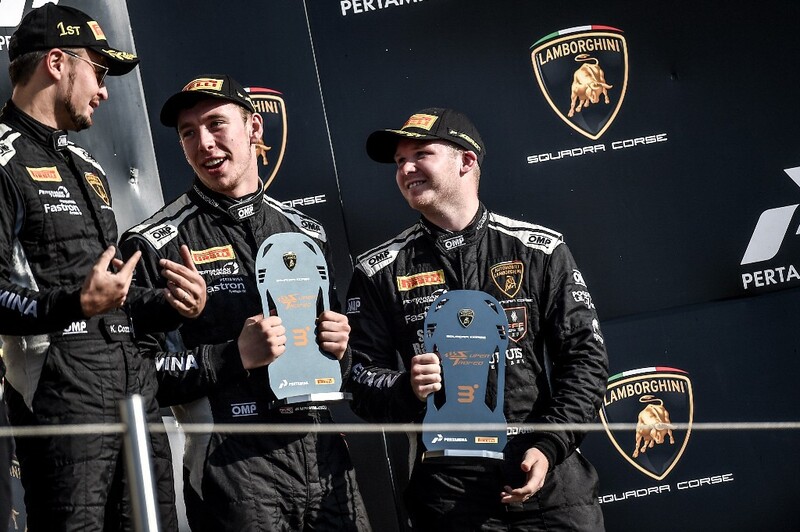 Last week was a busy time for FFF Racing by ACM as they completed the Super Trofeo Asia Series and then took part in the Lamborghini Super Trofeo Word Finals at the Imola circuit in Italy. Jack Bartholomew partnered up with Richard ‘Spike’ Goddard in the #205 Lamborghini Huracan for both the Asia finale and the World Finals, while Carrie Schreiner was joined by Alberto Di Folco for the Asia race in the #250 entry while Schreiner ran alone in the World Finals in the #255. Despite a frustrating start to the week of action due to the weather, the Chinese-based team concluded its programme for the season with third positions both in the Pro and Pro-Am class of the Super Trofeo Asia Series, while strong runs in the World Finals also yielded strong results. The team arrived at the circuit on Monday for what was expected to be a two-day test only to find a foot of snow blanketing the circuit and this curtailed the first day of the programme. The team was then greeted by heavy rain on the Tuesday and this meant that only a few shakedown laps could be completed. With so little running, the Wednesday rest day was given over to a full test day, but again rain hampered proceedings until later in the afternoon when everyone was able to get some slick tyre running ahead of the Asia finale on Thursday. The first round of qualifying saw Bartholomew and Schreiner on track recording the fourth and eighth best times respectively, while in the race Bartholomew and Goddard went one better with a third position finish in the Asian Pro class which in turn secured Bartholomew the same position in the Pro driver standings overall. 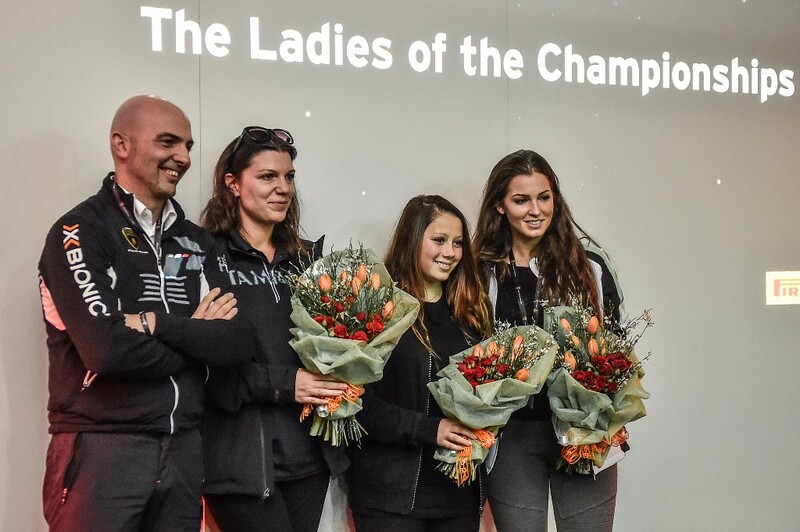 Schreiner and Di Folco finished fourth in the Pro-Am class, giving the former and Goddard third in the Pro-Am standings. With that mission accomplished, it was then on to the double-header World Finals where Schreiner qualified a solid seventh and ninth. The opening race was even better as she worked her way up the order to challenge for the lead only to be spun out by a rival before re-joining in 14th. The second race saw Schreiner running well again, but she fell foul of the minimum pit stop time requirements. Following a drive through penalty, Schreiner battled back to an impressive 11th. In the Pro class, Goddard and Bartholomew qualified 17th and tenth respectively for the two rounds. Goddard started the opening race only for a puncture and subsequent pit stop to send him down the order. Bartholomew put on a charge to finish in 19th. Bartholomew started the final race and was right on the pace from tenth position on the grid. He handed over the #205 entry after a strong run to Goddard who also enjoyed a good turn of pace to bring the car home in a hard-earned eighth position. 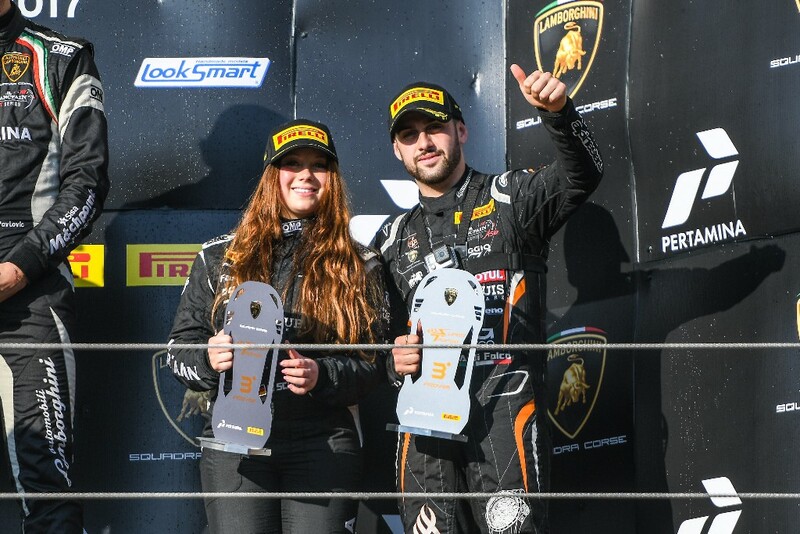 "To finish the 2017 Asian Lamborghini Super Trofeo series, third in the Pro drivers' standings with Jack Bartholomew and third in the Pro-Am drivers' standing with Carrie Schreiner and Spike Goddard when all the circuits where new to them was a great effort,” said FFF Racing Team Owner Sean Fu Songyang. "And then for Jack Bartholomew and Spike Goddard to have an eighth place in the last race of the world final event with all the cars from Europe, USA, and Asia taking part, bodes well for our 2018 Super Trofeo Asian programme where we will hope to go and challenge for the title with a two-car attack." Meanwhile over in Macau, the FIA GT World Cup proved to be a disappointment for the team and Mirko Bortolotti as a multi-car accident early in the race eliminated the Italian racer and 11 of his rivals. Sadly, the team, the only Lamborghini entry in the field, they played no further part in the weekend’s proceedings due to accident damage.